MOLDED HDPE REACTION CHAMBERS - RK25 models and up - unlike competing manufacturers our bodies are a one piece, rotationally molded design. This eliminates potential leaking and failtures from seams and weld points. Using HDPE makes our bodies rugged and ozone safe. They are also UV resistant making them safe for indoor or outdoor applications. 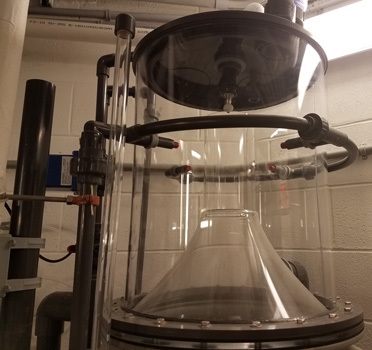 COUNTER CURRENT DESIGN - Allows for water entering the top of the fractionator to pass down through the rising air/water column. This creates a stripping effect and allows for better overall mass mixing. 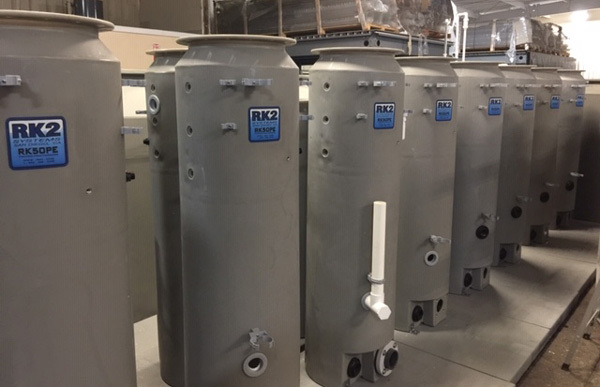 Competing manufactures have their supply, injection, and discharge ports all located in the same area making for a far less efficient fractionation process. 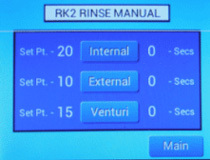 AUTOMATED WASH DOWN SYSTEM - Electronically controlled washdown system featuring touch screen HMI controls allowing for a simple programming of rinse cycles. 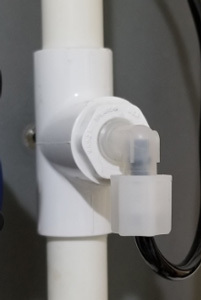 The internal rinse uses system water directly from the injector pump. 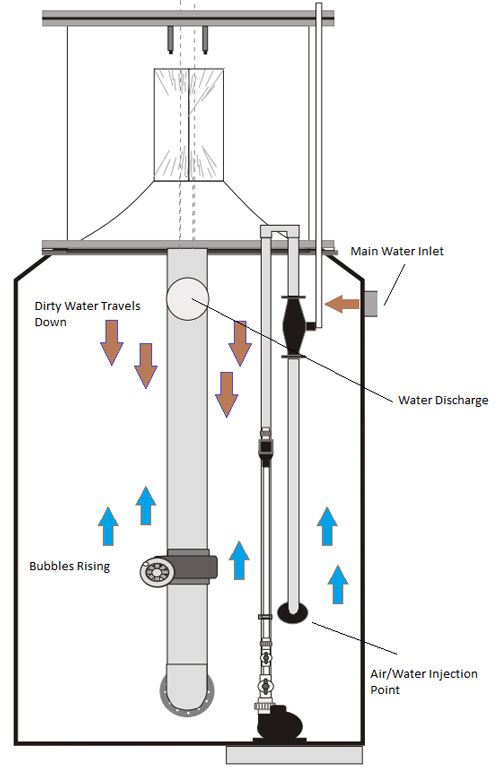 The external cone rinse uses a separate freshwater supply line to wash the outside of the cone. Unlike competing models that spray valuable system water down the drain every time the washdown is activated. **NEW** AUTOMATED VENTURI CLEANING - Industry First! We've added a solenoid valve to the venturi manifold that allows for automated cleaning of the venturi injector. 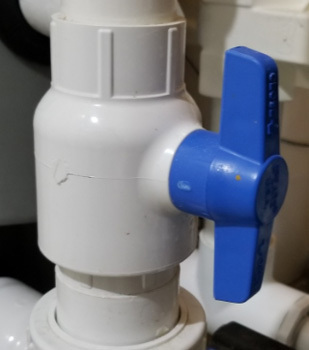 This valve can be programmed to open once an hour or up to once every 24 hours. It only takes a few seconds of freshwater rinse to clean the venturi. 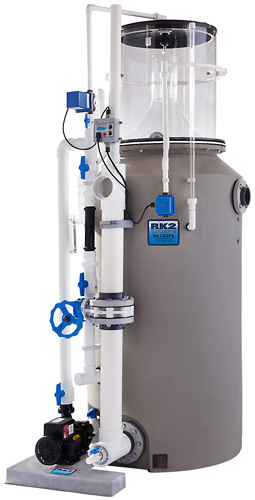 Maintaining your RK2 fractionator has never been easier! TUNED VENTURI PUMPS - We've worked with our motor supplier to select the most efficient pumps possible to pair with our venturi injectors. 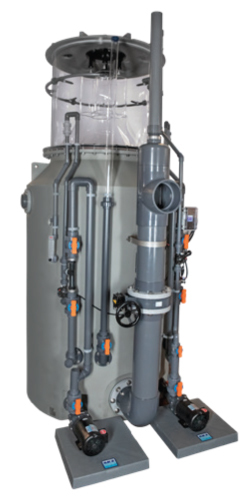 Unlike other manufacturer's we've matched each pump to the injector(s) of each specific fracitionator model. 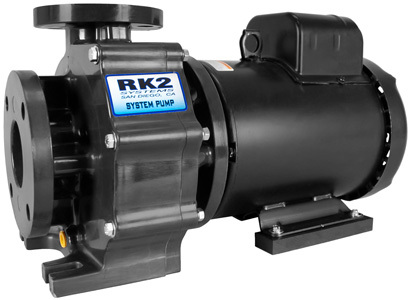 Blanket sizing of a fractionators pumps will lead to inefficient pump operation and possible pump failure from overworking. 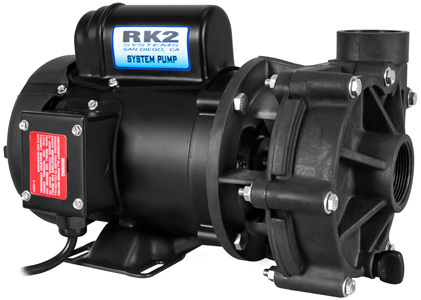 All pumps are standard 115/230V 60HZ Single Phase. Optional power configurations in 115-575VAC, 50/60Hz, amd 3 PH are all available upon request. KYNAR VENTURI INJECTORS - Our fractionators come standard with kynar venturi injectors from Mazzei, the best venturi available. 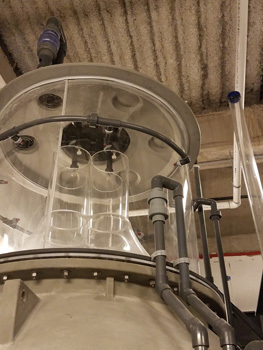 Using Kynar allows for ozone gas injection into the fractionator via the venturi. 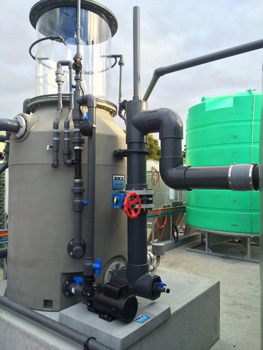 This eliminates the need for a separate port and/or pump to carry out ozone injection. 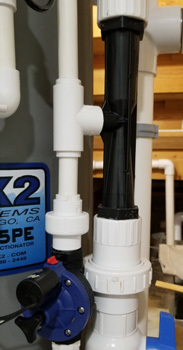 OZONE GAS CONNECTION PORT - We supply a separate ozone connection port as a standard feature. This fitting is normally capped of when not using ozone gas. When using ozone injection it is important to be able to precisely control the amount of gas being injected. 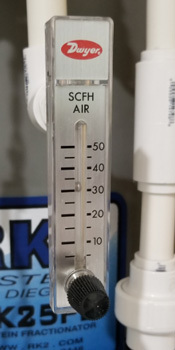 When combined with our airflow meters (see next feature below) this allows you to precisely control airflow of ozone gas and the correct amount of normal air needed for the fractionator. AIR FLOW METERS - Air Flow meters are provided as standard equipment. We supply one meter per venturi. This allows for proper adjustments when dialing in the fractionator. The addition of the air flow meters also allows you to monitor the airflow into the venturi for maintenance purposes. A drop in air flow could indicate the venturi needs cleaning or there is an obstruction in the venturi manifold loop. The air flow meter also allow for proper adjustment to overall air injection when adding ozone injection. MOLDED HDPE SCREW TOP LID - Makes maintenance and accessing the inside of the collection cup simple. CLEAR SIGHT GAUGE - Lets you see water level inside reaction chamber and allows for precise water level adjustments. SPEARS BALL VALVES - We use spears ball valves as standard. All models are upgradeable to Asahi or Hayward True Union Ball valves depending on your preference. (See upgrades and customizing section below). 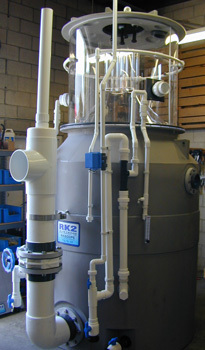 RK2 has been providing customized and upgraded options to our fractionators for years. We've had some unique requests over the past 25+ years but we've been able to meet them all. Is a model too tall for your desired location? Do you need different inlet/outlet sizes than what's standard? Have a preference to using true union ball valves?Not to worry, RK2 Systems has you covered with a wide range of available upgrades Call us today to discuss your requirements as we are willing and able to assist you with any custom configuration required.